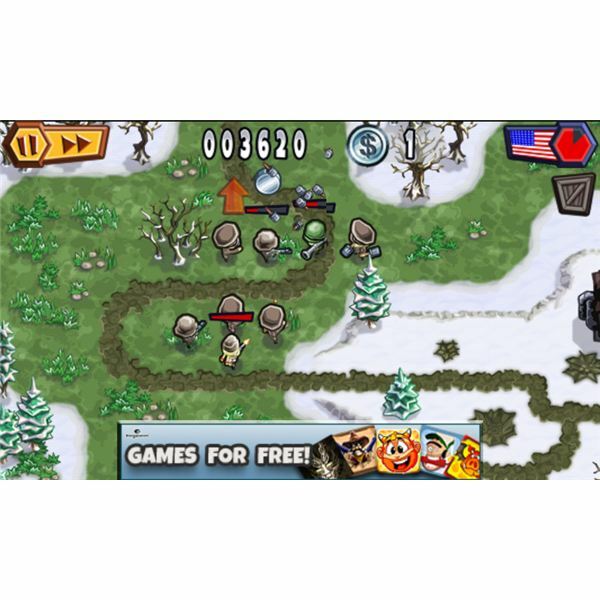 Guns ‘n’ Glory WW2 is like a mini-real-time strategy title for your smartphone. The first game was set in the Wild West but this time round we visit the Western Front in 1944. Playing as the German or American forces your mission is simple – defend your base from the incoming enemy. Each map features a number of different points of entry and you have three main buildings that must be defended at all costs. 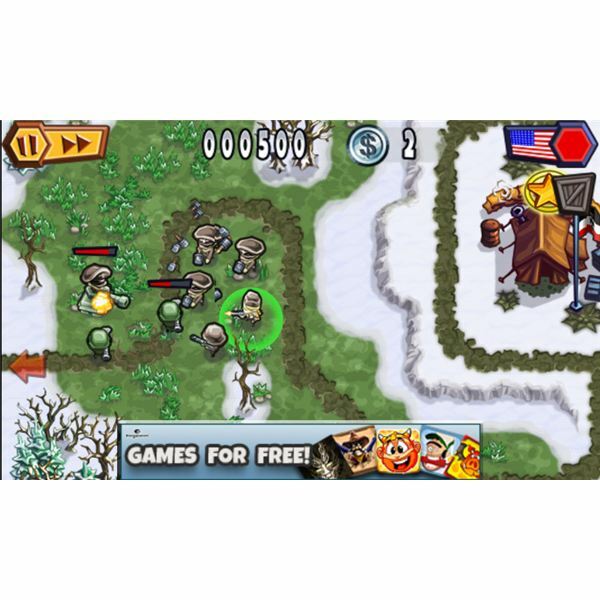 You’ll start with a handful of troops and you need to deploy them carefully to fight off the invaders. You’ll see red arrows to indicate exactly where on the map the next attack wave is coming from and the enemy forces will invade along clearly marked paths. There is a countdown to their arrival and you can tap on your troops to select them and then tap on the spot on the map that you want them to go to. 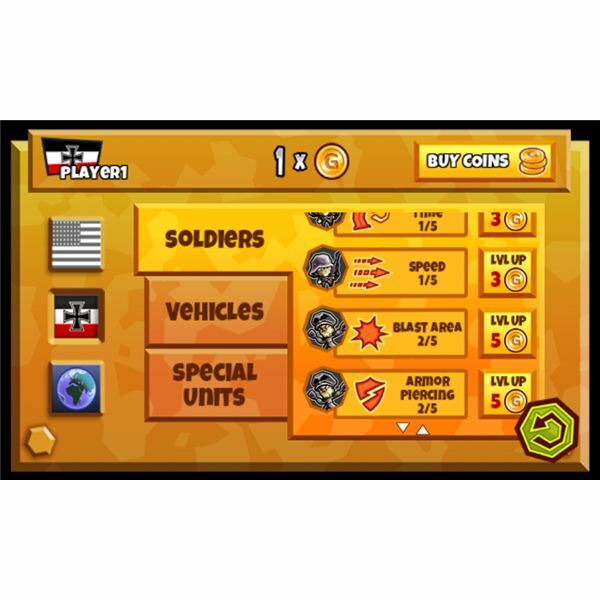 You also have coins to spend and you can tap on the barracks buildings and choose to recruit new troops with a variety of weapons, including machine guns, rocket launchers and flamethrowers. There is also a barracks for vehicles where you can buy tanks to deploy. As you send your foes to their doom you’ll earn extra coins to spend in the barracks so you can recruit reinforcements. You’ll also find that if any of your buildings get destroyed you’ll get a bonus batch of coins to help you defend the rest of your base. 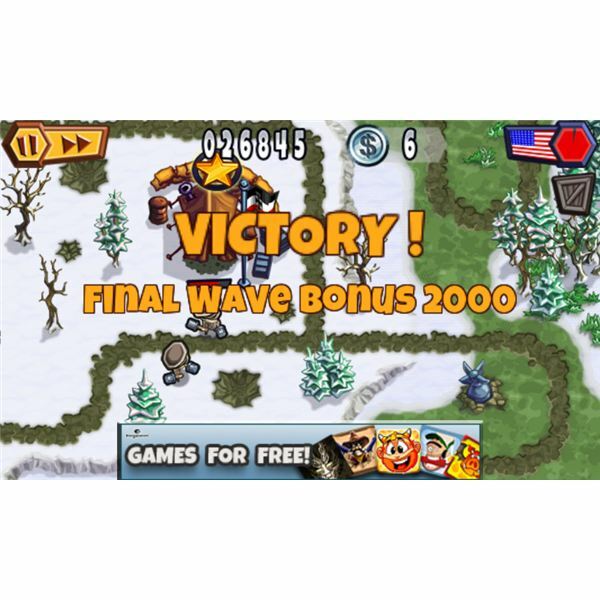 If you survive all of the waves of attack then you’ve completed the level and your score is added up. You’ll get a star rating based on how many of your buildings survived — so if you protect all three then you get the maximum three star rating. Your score is also added up based on remaining units and coins. You earn special Glory Coins as a reward for your efforts and you can spend them in the Shop to upgrade your forces. You can also buy Glory Coins with real cash if you like. They allow you to boost the damage your units dole out, improve their armor, and increase their speed amongst other things. There are 12 maps in total and each one has three difficulty levels to choose from. Guns ‘n’ Glory WW2 has a very cute, cartoon art style. The troops and vehicles have basic animations and there are some explosive effects. My favorite animation is undoubtedly the angel rising skyward when any soldier meets their end. The menus are all well laid out and very presentable. The soundtrack is suitably military and, although repetitive, the music won’t bother you too much. The sounds of battle add a little atmosphere and also provide cues to the action. You’ll also find that an attack on one of your buildings is accompanied by a vibrating alert so you can hardly fail to notice and you can respond immediately. Overall Guns ‘n’ Glory WW2 is a fun strategy game with a decent level of polish and it is completely free. It has the same addictive hook as tower defense games, but the ability to move your “towers” or troops in this case, makes it feel fresh. Let’s take a look at a few tips to help you to a glorious victory. There are a few things that aren’t immediately obvious when you start playing Guns ‘n’ Glory WW2 so we’ll start with some basic tips. The buildings you have to protect have stars above them and you can see how damaged they are by looking at the circle round the star. You don’t have to protect the barracks buildings unless they have stars above them (they do in some levels and not in others). You can tap the countdown at the top right to trigger the enemy wave immediately if you are ready for it. You can use the pinch to zoom gesture to zoom in and out. Crates can provide bonus additions to your arsenal such as air strikes and mines so look out for them. You tap on coins to collect them but for crates you need to send men to the spot. You can tap on specific enemies to concentrate your fire on them. Select the crate icon at the top right to use your special attacks. If you need a break between waves then hit the pause button at the top left. You can only select units one at a time so look for the red arrow or arrows marking the next waves and start repositioning your units immediately. It is tempting to block the access routes for enemy soldiers but this will make them more aggressive so it’s often not a good idea. It is generally best to space your soldiers out along the route because enemies will slip through as the numbers grow. It also ensures that you get more bang for your buck – if you have knots of soldiers they may all fire at a near dead enemy instead of firing at the next fresh one (remember you can tap on enemies to target them). Due to the slow reload rates you should definitely space out tanks and your rocket launcher soldiers or grenade wielding soldiers. The game gets very challenging on the higher difficulty levels so you might find it is best to spend all your Glory Coins on either the US or the German units rather than dividing them. This will give you a better chance of surviving the tough levels. If you get desperate you can always buy Glory Coins or pay to remove the ads via the online market in the game. If you choose to play as the Germans then your special medic unit is absolutely essential. You should place a bunch of soldiers around your medic and make sure that you keep her off the road and away from the enemy as much as possible. If you place her back from the road on a corner and then have grenadier, soldier, grenadier, soldier in a line round her you should find it works nicely and all your men will keep getting healed. She can't heal tanks. The grenadier units are the best because they can deal with soldiers and tanks and you can use the medic to heal them. It’s worth focussing your Glory Coin upgrades on the grenadiers and your medic. Your special unit as the Americans is the flamethrower. Since they set enemies on fire, which continues to do damage over time, you want to place your flamethrower units near the entry points on the map. The rocket launcher soldiers are also very handy since they can kill tanks and soldiers. Focus your Glory Coins on upgrading them. It’s also worth placing them a bit back off the road so they don’t get killed too quickly. The game gets very difficult as you progress and it can be fiendish on the higher difficulty levels. Got any good tips to share? Post a comment and let us know.